COOL BLOCKS® blade guides are made from a high tech, non-metallic composite material, "Graphite Impregnated Phenolic Laminate", which contains three synthetic dry lubricants that lubricate the blade but do not make it oily. 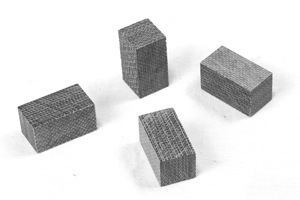 The metal to metal contact made by old metal guide blocks creates heat and friction which cause premature blade wear and breakage. These problems are eliminated with COOL BLOCKS blade guides which allow blades to run cooler and last longer with less friction. COOL BLOCKS blade guides will improve the cutting performance of any blade width, but are especially effective with 1/16" and 1/8" wide blades for tight radius work. 3 Guide Blocks 1/2" x 1/2" x 3/4"
1 Guide Block 1/2" x 3/8" x 1"
For Sears 12" Tilting Table Bandsaw, Skill 10", HD3640 & Dremel 10" 1120. 4 Guide Blocks 3/8" x 3/8" x 3/4"
2 Guide Blocks 3/8" x 3/8" x 1"
2 Guide Blocks 3/8" x 1/4" x 1-1/2"
4 Guide Blocks 1/2" x 1/2" x 3/4"
For 14", 16" & 18" Imported Band Saws using 12mm (.472) Round Guides. 4 Guide Blocks 12mm (.472) Dia. x 3/4"
For Delta 10" 28-560 3 Wheel and 12" 28-190 Band Saws. 4 Guide Blocks 5/16" Square x 3/4"
For Round Guides for 8" Delta 28-180 & 28-185 and 10" 3 Wheel Bench top Saw Including: Delta 28-160 and 28-180 8" s wheel, Sears, K-Mart, Ohio Forge, Protech, Builders Square. Most saws taking 56-1/8" blades. 4 Guide Blocks 3/16" Dia. x 3/4"
For 9" 2 Wheel Band Saw such as Ryobi, Black & Decker, Sears Craftman, Protech, Tradesman, and Collins etc. 2 Guide Blocks 13/64" square x 13/16"
2 Guide Blocks 13/64" square x 1"
Saw Blade Lubricant prolongs blade life and produces smoother and quicker cuts. Wax stick is specially formulated to keep metal, plastic, and wood cutting blades from clogging because of chips or pitch. 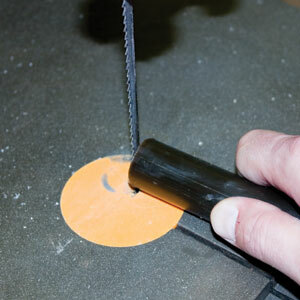 For use on all power and hand held cutting tools including scroll, band, circular, hack and jewelers saw blades. Lubricant Stick measures 8" long x 1" in diameter.